The small North Carolina mill town of Kannapolis left its mark on the U.S. economy and history by becoming the nation’s largest center for textiles manufacturing. In its next chapter, Kannapolis could become part of medical history. Duke University wants the medical research already underway at Kannapolis to become part of the federal Precision Medicine Initiative, a $215 million plan that President Obama announced earlier this year. By studying groups of people and tracking them over time—the federal initiative aims to form a national study group of 1 million people—the National Institutes of Health aims to improve understanding of disease and find new treatments. Federal officials in charge of the idea have talked about stitching together many regional studies as well as recruiting new volunteers, but planning is still in the early stages. Duke is among the first to express interest in joining the effort. The Kannapolis study is called the Measurement to Understand the Reclassification of Disease of Cabarrus/Kannapolis—the MURDOCK Study for short. 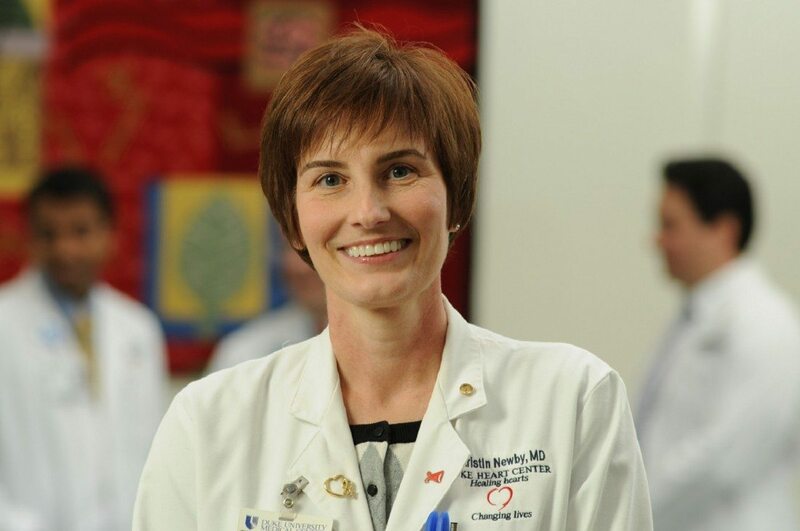 Kristin Newby, the Duke cardiologist who leads the study, says Duke has submitted a MURDOCK patient group to the federal initiative, in response to an NIH request. Newby, who took over as principal investigator earlier this year after Robert Califf joined the FDA as its top regulator of medical products and tobacco, says that working with other longitudinal, or long-term, studies was always among the MURDOCK Study’s goals. “We really want to encourage investigators far and wide to access the resource,” Newby says. The MURDOCK acronym is a reference to the study’s benefactor, David H. Murdock, the owner and chairman of Westlake Village, CA-based Dole Foods. Murdock has spent some of his fortune restoring the economy of Kannapolis and surrounding Cabarrus County, where he keeps a home. At its peak, the Cannon Mills facility in Kannapolis produced more towels and bedding than anywhere else in the United States. The site’s ultimate owner, the Pillowtex Corporation, shuttered the company in a 2003 bankruptcy. A year later, Murdock won an auction for the land of the former Pillowtex site. Soon afterward, Murdock began laying out his vision of turning Kannapolis into a research hub. The former Cannon Mills property still dominates the Kannapolis landscape, but new buildings there now house laboratories, not looms. The site is home to the North Carolina Research Campus, a 350-acre research park where universities and food companies pursue food research side by side. A total of nine academic institutions keep a presence on the campus. The University of North Carolina at Chapel Hill’s Nutrition Institute is based there, as is North Carolina State University’s Plants for Human Health Institute. Duke’s presence is the MURDOCK Study. Murdock established the study in 2006 with a $35 million gift. Califf, then a Duke cardiologist, assembled the MURDOCK team from various disciplines. Newby was part of that early team; she says she has long had an interest in using statistics and analysis in medical treatment, specifically to help guide a physician’s choice of drug to treat a particular condition. Newby says she has made this approach to medicine part of her work since she began at Duke in the early 1990s. Long-term precision medicine studies similar to MURDOCK are underway in other parts of the country. In Seattle, the Institute for Systems Biology last year launched the 100K Wellness Project, which aims to mine the data of up to 100,000 volunteers to find ways to diagnose, treat, and prevent disease. A spinout based on its premise launched this week. And in April, the California Initiative for Advancing Precision Medicine launched with the goal of studying patient data from the University of California’s vast health system and beyond. All of these long-term—or longitudinal—studies, including MURDOCK, take their cue from the Framingham Heart Study. Originally started in 1948 with more than 5,000 women and men recruited from Framingham, MA, a town outside Boston, the study is now on its third generation of patients. MURDOCK aims to enroll 50,000 volunteers, which represents about one third of Cabarrus County’s population. Enrollment currently stands at more than 11,500. MURDOCK aims to surpass Framingham not just with more people enrolled, but with a wider range of diseases studied. Initially, the Kannapolis/Cabarrus research focused on liver disease, obesity, and osteoarthritis, as well as cardiovascular disease. Research has since expanded to include multiple sclerosis and prostate cancer. Newby says that MURDOCK is able to add more areas of research because of its biobank of patient information. The biobank—technically a community registry and biorepository—stores samples of volunteers’ blood and urine, an idea that Newby implemented in 2009. It has the capacity to store up to 10 million samples and is operated by Burlington, NC-based laboratory and diagnostics company LabCorp (NYSE: LH). With the storehouse of samples at hand, Newby and her colleagues can branch out into new diseases, or pursue new ideas, without necessarily recruiting new patients. Framingham started collecting biological samples years after its start, which limits the new research the study can do on data from its earliest volunteers. MURDOCK researchers have collected samples from the beginning. That means when an investigator proposes a new area of study, MURDOCK will already have an intact cohort with biological samples ready and waiting, Newby says.